I’ve recently presented at a number of venture capital firms about the next cycle or wave of innovation. An important fundamental observation is to understand that hardware innovations drive software innovations. That software can be local or cloud-based but, the bottom line is, hardware innovation is necessary to move software industries forward. With that in mind, it seems we are nearing the end of the mobile hardware cycle. There are several observations I want to make about this chart. The chart is depicting the PC, tablet, and smartphone computing cycle we have just gone through. You’ll notice a few things. First, it was big. That should be the obvious one. Second, you notice the smartphone is the largest part of this wave. The smartphone drove an internet-connected computing device into the global mainstream in a way no piece of hardware before it could. You may also notice the S-curve is slowing, which is why it seems we are nearing the end of this particular hardware cycle. But the most interesting observation is how short the wave is. Notice this wave grew inside the span of less than ten years, compared to the early cycle driven largely by desktops and notebooks that steadily grew over 20 years. The large global rollout of computing is a recent phenomena. We still have much to learn as many of the lessons in the first 25 years of computing are no longer applicable in an age where computing has gone where is had not been before. There are still a few hardware innovations in smartphones to come, like dual lens cameras, which will continue to drive new software innovations. But largely, we are moving from a hardware cycle to a software cycle. 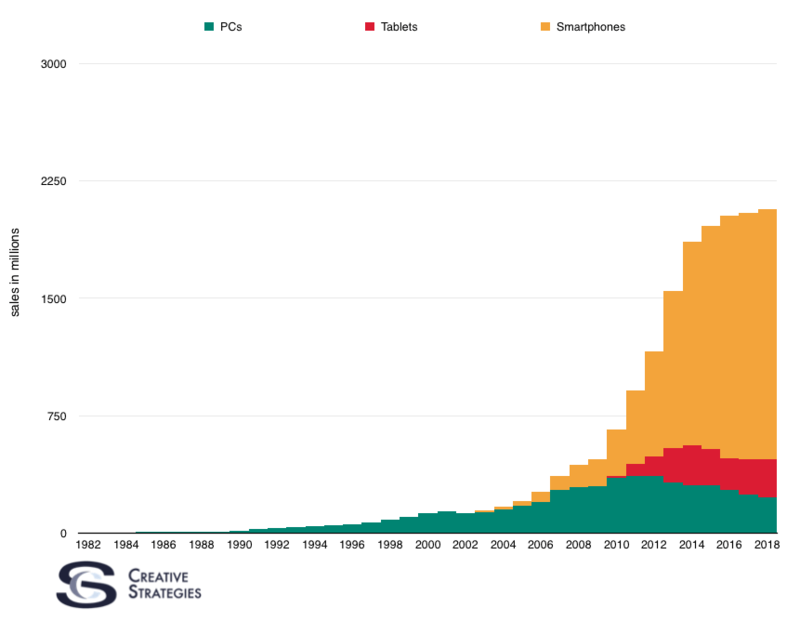 This hardware cycle adds roughly another billion consumers to the computing landscape and, between PCs, smartphones, and tablets, we now have roughly two billion people with an internet-connected computing device. During the PC era, our software scale was measured in hundreds of millions but now, thanks to the smartphone, the software industry scale is two billion global consumers and growing. Companies who can leverage this scale are the ones getting the most attention. Key in that discussion are Facebook and Google. But the hunt is on for other companies who can create a software experience that appeals to billions, not just millions. The list of companies who can achieve software scale in the billions like Facebook may be short but the largest computing base in the history of the industry now exists so anything is possible. Looking at the type of category which has the best chance at scale, I can narrow it down to a few. From survey data we have, we know the top categories with the most active users are: Social networks, chat/messaging apps, games, maps, photo apps, and music/video. It is likely any app looking for a hundred million user scale and beyond should focus on these categories in order to achieve orders of magnitude of scale greater than other categories offer. Chasing scale will be one driven by business models. Those apps which are free and make money off of ads or other services will easily acquire the most customers. However, as this new global consumer market for technology software begins to segment, as we are seeing happen right now, there will be lucrative pockets of opportunity where money can be made without achieving massive scale. The temptation for many companies will be to chase active users instead of focusing on their segment and serve it well. Perhaps no better current example exists than Snapchat. Snapchat is at a crossroads where they can focus on their current base of users under the age of 30, which will get them in the 200m user range but not much more. To get beyond that number, Snapchat will need to adapt their service to appeal to a larger demographic. From the outside looking in, it seems Snapchat is attempting to do this right now. However, there is a risk this will come at the expense of their current users. They may alienate their younger audience as the older demographics get on the service. This is what happened with Facebook as engagement declined significantly with the younger demographic once their parents started using it. They didn’t leave — they just used it less. They moved to apps like Instagram, which Facebook then bought to help retain some engagement with that audience. This is also why Facebook would buy Snapchat if they had the chance. Owning a profitable segment of the market is valuable but often, due to investment or growth pressure, companies will look to serve a broader demographic and thus begin to underserve the one which helped them get where they are. Whether or not this pursuit will pay off will be the key story line to watch as companies attempt to grow beyond the segments they begin in. Understanding segmentation is the key to understanding the market. There is no single “market”. There are many markets which make up larger markets. If you don’t understand each pocket or segment of the global consumer market, you don’t actually understand the market beyond the surface. This is why, while difficult, I try to see the forest and the trees at the same time. So what’s next? Is it VR? Is it further advancements in artificial intelligence? Smart home? Self-driving cars? Or it could be something entirely different and unknown. Whatever it is, it’s likely to come from the foundation of global mobile computing because it is hard to think of any product, one almost every adult on the planet will some day own, that has the scale of the smartphone.